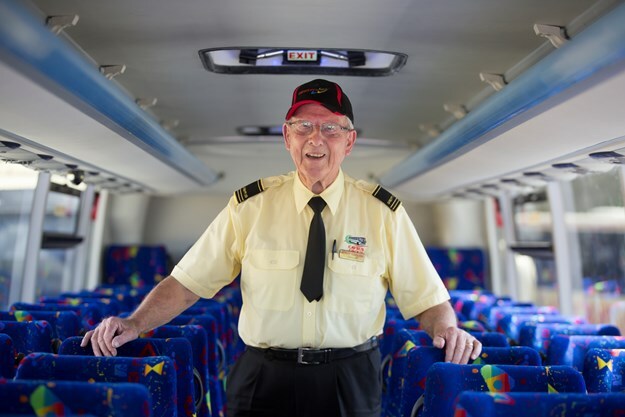 He’s picked up children on their first day of school and dropped them off on graduation day; Derek Jones retires after almost 12 years behind the wheel of Logan Coaches buses. 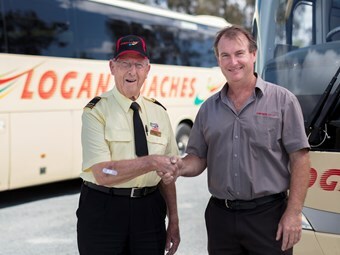 (L-R) Derek Jones with Peter Bowerman, general manager of Logan Coaches. 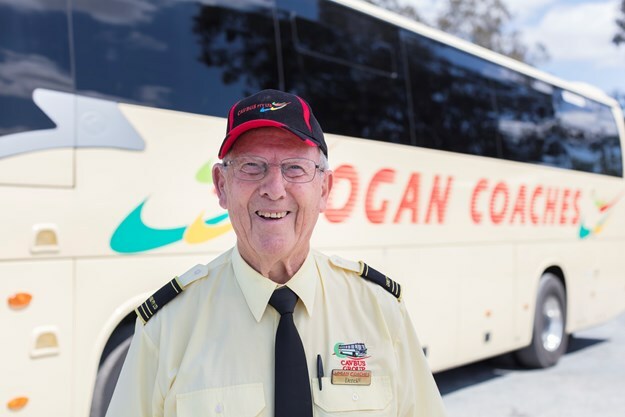 Known as the driver of school routes 14 and 15 in Logan Village, Queensland, Derek Jones has called it quits at the age of 88. 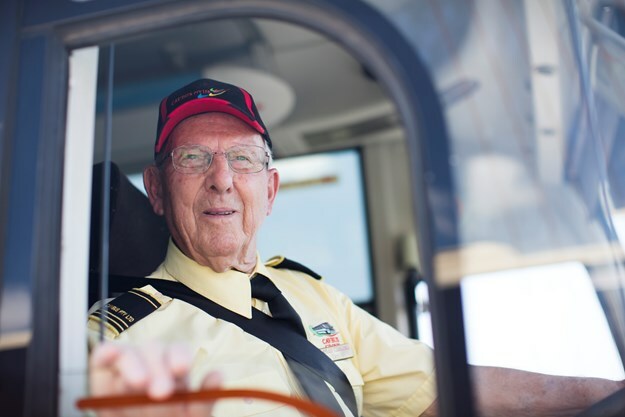 Jones says driving a school bus has been a rewarding experience, but it’s time to hang up the keys and concentrate on the finer things in life. He was the driver with the friendly attitude; always one to raise his hand for the job, whether it be school runs, rail-replacement work or taking students to excursions. Having migrated to Australia from England in 2003 with his wife Jenny, Jones’s plan was to buy a caravan and see the country. 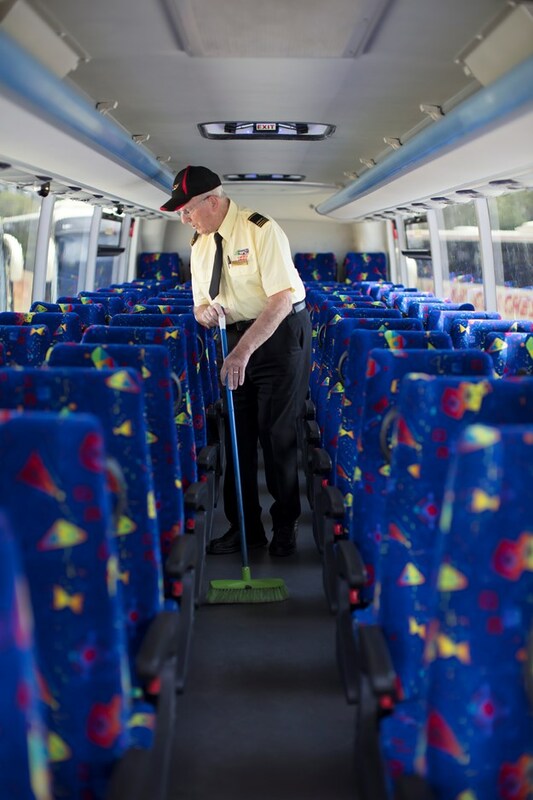 He reached out to Brookers Bus and Coach in Beenleigh, outside Brisbane, asking to borrow a bus to practice for a licence, but the company directed him to the transport department, saying if he passes the test to come and drive for them. He came back and ended up driving for four years before moving on to Logan Coaches. "Needless to say I never ended up buying a motor home," Jones said. Jones says he never found bus driving or dealing with kids stressful; in fact, he describes the journey as "very smooth", saying kids had great respect for him. "Even at my age they called me Derek; it was always ‘good morning’ and ‘have a nice day, Derek’," he explained. "I never had any real issues with them. I had one or two clever ones, but mostly they were very respectful and we respected each other. "I didn’t find it stressful because I think you can make your own stress in life. "If you’re pleasant with everyone and you don’t start getting aggravated or impatient, I think life is very smooth. You just have to stay calm, cool and collected." Having retired on October 1, Jones says that during those 15 years he’d drive an average of 1,000 kilometres per week. He’d usually drive 60 students a day, with up to 500 a week. A few of those have caught his bus until the very last day of school. "Seeing them grow up was very strange, actually. You can’t believe it when you see it – you see them at age 18 and they’re completely different people. You watch them grow up and it’s like having your own children," Jones said. Most of the parents knew him well and trusted him with the safe delivery of their children to and from school, he adds. As a father of two children and great-grandfather of two, Jones never lacked a card or two at Christmas from his passengers and has very fond memories of the children he carried. "It was quite a good experience because we had a variety of work to do, with school bus being [the] main part of the job," Jones said. "It was a very pleasant area to drive in. Most of my work was around the country areas and the only time I went into town was to take kids into school and doing the rail work." Having experienced only minor scratches and no serious accidents, Jones describes driving as therapeutic. 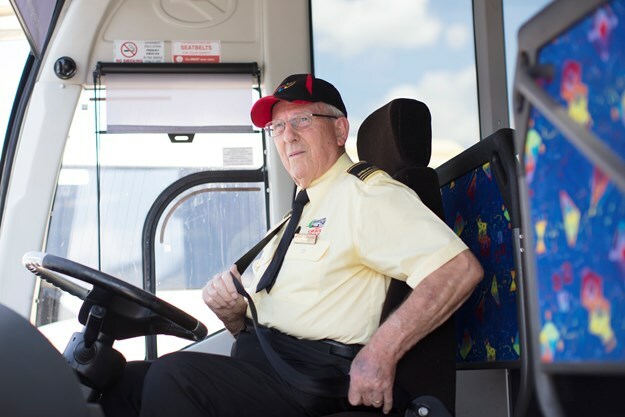 He always wanted to be a bus driver, but somehow ended up in sales during his career in England after coming out of the air force. Jones came to visit relatives in Australia in 1996 after becoming a widower, where he then met Jenny, who was also English. The pair decided to move to Australia in 2003, setting up home in the Beenligh region. Logan Coaches administrator Greg Hand says Jones never said no to a job he was asked to do. "If there was a bus involved he would be first to have his hand up for the job," Hand said. "Derek had an amazing rapport with the students he carried, many of whom he saw start primary school and finish high school. "In many ways he contributed to the adults they became." One thing that annoyed him about bus driving was the lack of respect he’d experience from fellow road users. "On any given day I would be cut off by another driver and given the royal one-finger salute," Jones recalled. "They seemed completely oblivious to the fact that there are up to 60 students on the bus, who are put in danger through their impatience. "However, I think [a] bus driver is a good role to have and it can be a very happy way of life if you want it to be that way," he added. "I believe if you have a problem in the job, talk to the boss and work it out, a solution can always be found." I’m a bit of a Westlife fan, but I can’t think of a name at the moment. Tokyo – I went there earlier this year after attending a wedding in England; my great experience was going up the 2,000-foot tower. I suppose I like a whiskey and lemonade. I’d go back where I started because I’ve had a good life, but in the world I would like to change so that everybody is friends with everyone. I learned that I’m cool, calm and collected because I’ve had a couple of issues and sorted it out with no problem, like trouble with the car. My wife; I can’t be without her, she’s the most important thing in my life.